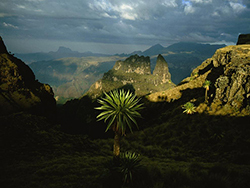 Ethiopia is the oldest independent country in Africa and one of the oldest in the world. What are believed to be the oldest remains of a human ancestor ever found, which have been dated as being some five million years old, were discovered in the Awash Valley in Ethiopia. This beats the discovery of "Lucy", a 3.2 million year old skeleton, who was unearthed in the same area in 1974. Ethiopia is located in the Horn of Africa on the continent’s northeast coast. Ethiopia borders six countries in total: Sudan, South Sudan, Kenya, Djibouti, Somalia and Eritrea. Addis Ababa, the capital city, is located in the middle of country and the land contains a wide altitude range, from 100 meters below sea-level on the north-eastern border to more than 4000 meters above sea-level in the country's mountain ranges. The differences in altitude around the country results in variable temperature conditions, and a rainy season that spans the majority of the area between June and August. The land, however, is vulnerable to droughts mostly in pastoral regions during other times of the year - a problem which first began in 1972 and has persisted on a seasonal basis. 96 million people live in Ethiopia, with major ethnic groups including Oromo (34.4%) and Amhara (27%). 17% of the total population lives in urban areas, and about 3 million people live in the capital city of Addis Ababa. Interestingly, the country is comprised of a mostly young population, with a median age for both males and females of 17 years old. In addition, Oromo and Amharic are the most common spoken languages. In regards to religion, approximately half of the country's population is Christian and one-third are Muslim. Menelik I first Solomonic Emperor of Ethiopia, is traditionally believed to be the son of King Solomon of ancient Israel and Makeda, ancient Queen of Sheba. He is alleged to have ruled around 950 BC, according to traditional sources. Tradition credits him with bringing the Ark of the Covenant to Ethiopia, following a visit to Jerusalem to meet his father upon reaching adulthood. According to the Kebra Nagast, King Solomon had intended on sending one son of each of his nobles and one son of each temple priest with Menelik upon his return to his mother's kingdom. He is supposed to have had a replica made of the Ark for them to take with them. 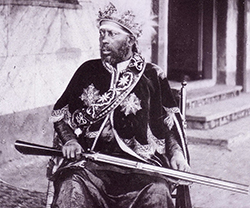 Upon the death of Queen Makeda, Menelik assumed the throne with the new title of Emperor and King of Kings of Ethiopia. Emperor Menelik II baptized as Sahle Maryam (17 August 1844 - 12 December 1913), was Negus of Shewa (1866-89), then negusa negust of Ethiopia from 1889 to his death. At the height of his internal power and external prestige, the process of territorial expansion and creation of the modern empire-state had been completed by 1898, thus restoring the ancient Ethiopian Kingdom to its glory of the Axumite Empire which was one of the four most powerful kingdoms of the ancient world. Ethiopia was transformed under Negusa negust Menelik: the major signposts of modernization were put in place. Externally, his victory over the Italian invaders had earned him great fame: following Adwa, recognition of Ethiopia’s independence by external powers was expressed in terms of diplomatic representation at the court of Menelik and delineation of Ethiopia’s boundaries with the adjacent colonies. Menelik expanded his kingdom to the south and east, expanding into Kaffa, Sidama, Wolayta and other kingdoms. He is widely called Emiye Menelik in Ethiopia for his forgiving nature and his selfless deeds to the poor. 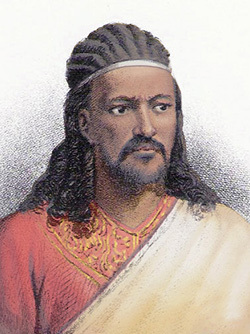 Tewodros II baptized as Sahle Dingil, and often referred to in English by the equivalent Theodore II (1818 – April 13, 1868) was the Emperor of Ethiopia from 1855 until his death. He was born Kassa Haile Giorgis, but was more regularly referred to as Kassa Hailu meaning "restitution" His rule is often placed as the beginning of modern Ethiopia, ending the decentralized Zemene Mesafint (Era of the Princes). 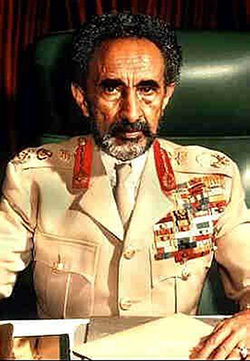 Haile Selassie I, 23 July 1892 - 27 August 1975 born Tafari Makonnen Woldemikael was Ethiopia's regent from 1916 to 1930 and Emperor of Ethiopia from 1930 to 1974. He also served as Chairperson of the Organisation of African Unity from 25 May 1963 to 17 July 1964 and 5 November 1966 to 11 September 1967. He was a member of the Solomonic Dynasty. At the League of Nations in 1936, the Emperor condemned the use of chemical weapons by Italy against his people during the Second Italo–Ethiopian War. His internationalist views led to Ethiopia's becoming a charter member of the United Nations, and his political thought and experience in promoting multilateralism and collective security have proved seminal and enduring. His suppression of rebellions among the landed aristocracy (the mesafint), which consistently opposed his reforms, as well as what some critics perceived to be Ethiopia's failure to modernize rapidly enough earned him criticism among some contemporaries and historians. His regime was also criticized by human rights groups, such as Human Rights Watch, as autocratic and illiberal. Among the Rastafari movement, whose followers are estimated at between two and four million, Haile Selassie is revered as the returned messiah of the Bible, God incarnate. Beginning in Jamaica in the 1930s, the Rastafari movement perceives Haile Selassie as a messianic figure who will lead a future golden age of eternal peace, righteousness, and prosperity.Haile Selassie was an Ethiopian Orthodox Christian throughout his life. Haile Selassie is a defining figure in both Ethiopian and African history.